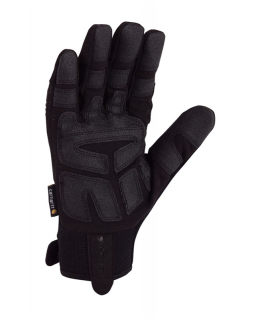 The rugged features of this high-dexterity ballistic glove will make it a regular choice for workdays and weekends alike. It's constructed of textured, breathable, and stretchable spandex for comfort and control, and features a reinforced palm to dampen vibration. Thermoplastic rubber knuckle protection and reinforced finger wrap caps help protect hands, and the neoprene cuff with hook-and-loop closure at the wrist provides a secure fit.